Life of a Knitphomaniac: And we have a contract!!!!! And we have a contract!!!!! I am so excited that there is a contract on my house for sale. I was very excited that it only took a little over 2 weeks.....every month I have to make that mortgage payment, I cringe! I hope posting it here (and I already posted on FB) does not jinx me! What has everyone been up to? I have been plugging away on 3 main things....and they are all KAL's. There is my Hiya Hiya Waves Scarf KAL.....my Hiya Hiya Diamondoid Socks KAL....and the HyperCrazy KAL for the San Antonio SNB. We had a tiny party for the Ravellenics at SNB this past weekend. I made out like a bandit....but I did all of the number generations in front of ppl so they could see it was not rigged......however, there was an awkward moment....before the party started, Shannon was admiring some gradient lace yarn....and I said how pretty it was and now if I could only rig it to where I win it.....then, when my number comes up on the random number generator.....Shannon was like "Weren't you just saying you were going to rig it where you won that?" Suspicious awkward moment! I left feeling a little guilty (like ppl really thought I did rig it somehow) but I know I did not and hey.....I have always said in the past that I never win anything....this time all the luck changed and I won a lot....maybe next year someone else will want to take over....I can only wish! It was tons of fun! I also want to Thank all the Raveletes, and also a big Thank You to Yarn Barn of SA, Yarnivore, and Inskein Yarns for all their awesome donations!!!!! My birthday was a couple of weeks ago and a friend of mine got me a gift card to Miss Babs.....so I ordered some Yummy Yarn in Shining City colorway and two small skeins of the Lip Gloss colorway for socks. I do love Miss Babs Yarn....the first packages of her arm chair tour should be mailing this week. My bags are packed and I cannot wait to find out where we are going! I have a couple more stash enhancements.....when I went to Inskein Yarns this past Friday night to pick up their donations...LeiLani from Heavenly Fibers was there....and on the floor was the most perfect colored yarn....I was drooling....turns out she dyed this yarn just for me.....Can you say, "I love you"? Well, I love LeiLani....thank you so much. I bought two skeins of the "Hook 'em" colorway, in a gradient! Now the next enhancement is not really 'stash'. You have all heard me talk about Darlene....well, she loves stitch markers from Vanessa, owner of Vintage Rose on Etsy...She told me Vanessa was going to start selling necklaces with a large lobster claw that we can use as lanyards (I have to wear my badge around work all day). I special ordered one with two balls of yarn and no leaf charm and it came in....I love it! Thank you Vanessa for such great items! Lastly, a friend of mine from SNB had this cute little tin with hand cream in it that she got from a yarn store in Florida. I loved it so I started looking for it online....she said it was like $24.90 or $24.95 for this tiny tin...well, I found some for $2.49 so I assumed it was a little sample size...so I ordered a few, then my friend was ordering more so I asked her to order me a few more....they came in and they are FULL SIZE....for $2.49. I really love them and now I have at least one for each project bag....Thank you Carol for turning me on to these awesome hand creams that smell like beautiful jasmine! Now I have a tip for you.....how many of you out there use lifelines? I admit I a not that good about using them and I usually regret it later...but you have to go find some thin yarn or thread somewhere and it is never handy and well, too much of a hassle....till now! My friends Suzi and Evelyn came up with these cute crochet thread holders....you can put the little ziplock baggie in your notions bag and always have an array of colors to use as a lifeline, or pop one of the small individual ones into a project bag and go....now you will never be without yarn/thread for a lifeline! Lifelines are like umbrellas, you will only need them when you don't have one. Always love reading your blog. 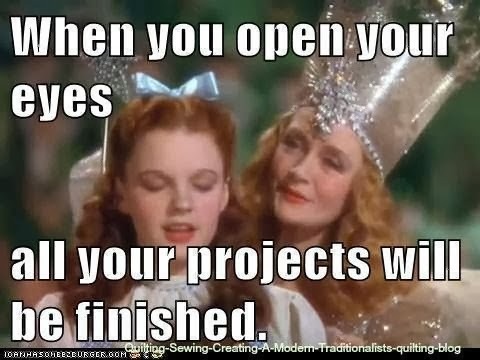 That is so many projects you are working on simultaneously. I have lots of OTN projects, but I cannot get as many stitches out of these fingers as you do. Enjoy reading about yours. Congrats on the contract on the house. Hope it goes through quick and fast for you. I must have spoke too soon! What is with this weather?